I had a bad attitude going into this run. I really didn't want to like it but the event itself turned me around. It was the second biggest marathon in the UK after London and had 11000 runners all running the marathon. As with most of these big events you have to pick your number up before hand. For Brighton this is a pain in the neck and with a hot day, roadworks and traffic jams it was not a pleasant experience. But thats what it is. It was also an expensive event (~€100) and I struggle to see where all the money was spent. Due to the warm weather during the previous week the organisers has issued pollution warnings coming upto the event. In the end it was fine. All of this aside I really enjoyed the event. It was 1.5hr drive to the race. Similar to Belfast the start is around 3 miles from the finish. I was a late entry and the park and ride was sold out so I decided to park at the start and walk from the finish. I managed to get within 500m from the start. In retrospect I should have brought some money and got a taxi back. But you live and learn. I got there early and fortunately I am a customer of one of the sponsors so had a VIP armband and got into an enclosure that had tea and coffee on tap, water and free rub downs as well as priority baggage and luxury loos. I have to say it was a very comfortable start to the day. A pretty decent looking 10K was off at 8:30 and we were due at 9:15 (started by Jo Pavy). There must have been some serious prize money on offer as there were a lot of African elites there. It was eventually won in 2:10. I spent a lot of time at the start debating whether to use a HR monitor with my new Polar RC3 GPS watch (£40 from a sale in Halfords). I decided not , as long term usage and chaffing has yet to be proven. I have to say I love the watch and out performs my Garmin (for me anyway). The only negative I have is that there is no link to Strava and we all know if its not on Strava it didn't happen. With 11000 competitors there was a 5 wave start and it was estimated that it could take 20-30 minutes to get off the line. I was in Wave 2 and got off within a few minutes. The course you would have thought would be flat but it was surprisingly undulating at 750ft which is average for a marathon but could never be described as flat. Most of the climb was in the fist half. It took a couple of miles for the crowd to thin enough to get a good pace going and I surprised myself by going through 5K in 26 minutes. I felt great and kept going. The 2nd 5K was even better and 10K was through in 51:30. There were many, many water and Gatorade stops on the course. At 10K we eventually made it to the coast and there was a very stiff breeze coming in from the sea. It was a fair wind that kept us cool and was even in the face and back. At 10K I saw the leaders going through the 11 mile mark which was very humbling. I came through half way in 1:47:40. I had the course measure a bit long (1/4 mile) and my official splits are little slower and officially I was 1:48. Even still this is the best first half I have had in a long time. Apart from a few long drags and switchbacks into the town we stuck by the coast for most of the race. Being by the sea was great. The support that was on the streets was tremendous and as there were a lot of charity runners it was LOUD. I ran the whole race pressing all the time and came through 20 miles in 2:50 and 21 miles before 3 hours. I was very pleased that to this point I was well under 9 minute miles and even some under 8. After 20 miles this slowed to 9's but never above 10. It got pretty hot during the last 10K. I knew from a long way out that I was breaking 4hrs but put a real effort in to beat 3:50 and I thought I was doing it but the course was a little long. I had me coming through marathon in 3:48 but my official time is 3:50:14 despite a sprint for the line. I can honestly say I left nothing on the course today. The last mile was noisy and well supported and the goodie bag and medal after were all good. The 3 mile hike back to the car wasn't. I didn't see anyone I knew today. 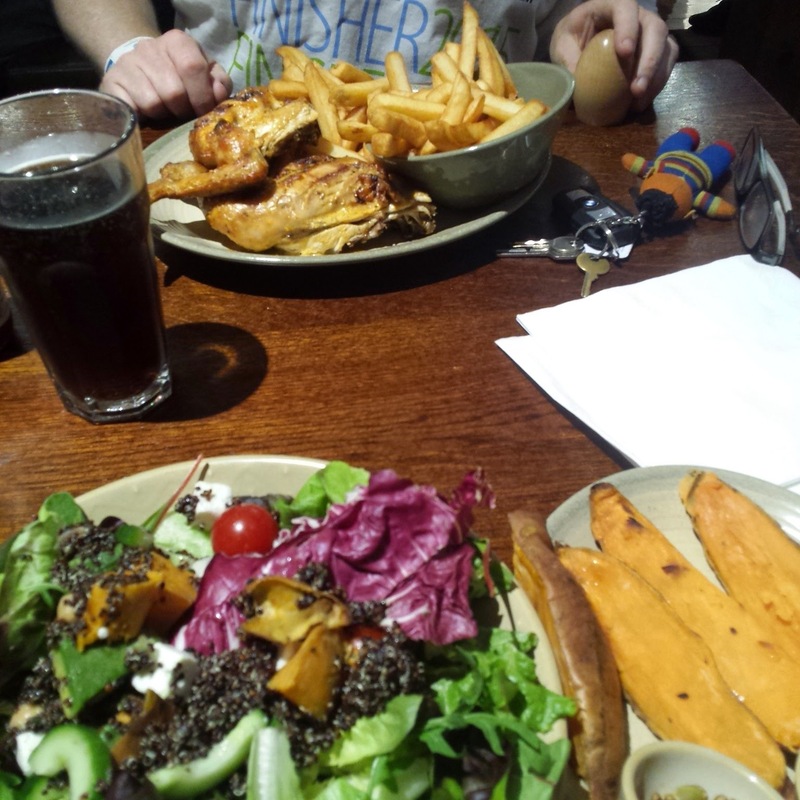 Ellie (#1 daughter) and I enjoyed a protein overdose at Nando's on the way home . Yummmm!!!!!! So all in all I enjoyed my day and would consider it again.